A couple of months ago I ordered some lemongrass essential oil to make an insect repellent that I never got around to doing. Then I goofed on my Essential Rewards order and got a repeat of the previous month – resulting in two nice big bottles of lemongrass EO. I love the smell of lemon so it isn’t as bad as it sounds, but I wanted to find out a few more lemongrass oil uses and benefits. * Here is what I found. Lemongrass, which grows in Asia, India and other warm climates, is commonly used in cooking as well as in tea. Lemongrass oil is used in cosmetics, soaps and other products. There have been lots of studies on the benefits of lemongrass essential oil, and it’s great for all sorts of uses besides the commonly known ones. According to the Journal of Advanced Pharmaceutical Technology & Research, “The plant is used as a fragrance and flavoring agent and in folk medicine as an antispasmodic, hypotensive, anticonvulsant, analgesic, antiemetic, antitussive, antirheumatic, antiseptic and treatment for nervous and gastrointestinal disorders and fevers.” It is also used as an antibacterial, antidiarrheal and antioxidant. 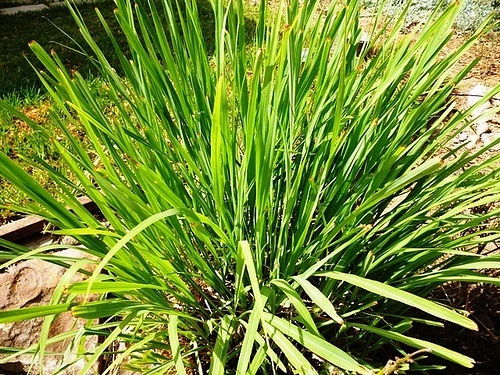 Lemongrass EO is used topically for headaches, stomachaches and muscle pain. It can irritate your skin so be sure to dilute it with a carrier oil if you decide to use it topically (I dabbed a little on my skin and noticed slight irritation. In the future I will use a carrier oil.) It’s a useful analgesic and also has antibacterial, anticancer, anti-inflammatory and antiseptic properties. In her book Flowers that Heal, flower essence expert Patricia Kaminski says lemongrass EO can be helpful for treating hair loss, scalp conditions and oily hair. Consider diluting a few drops in your shampoo or conditioner to improve hair growth while giving yourself an aromatic boost. Because it is a natural anti-inflammatory, you can also add a drop or two to your body lotion or to a carrier oil and massage it into achy muscles. 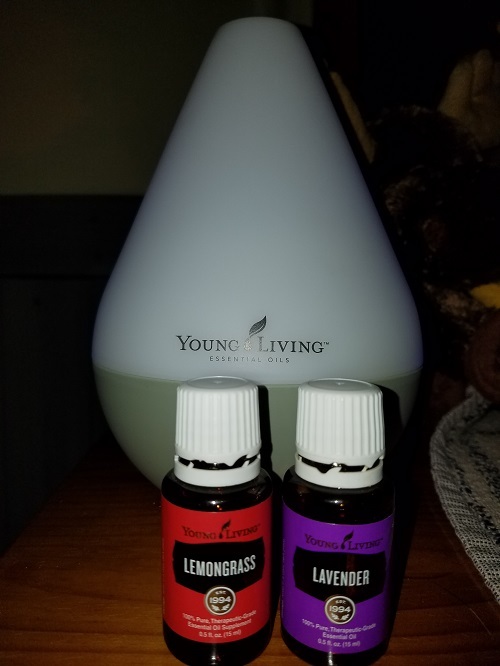 When I read about lemongrass essential oil being good for headaches, I made a beeline for my diffuser and added a few drops along with a few drops of lavender. It smells really amazing in here right now and my headache seems somewhat better so far. My headaches are notoriously difficult to treat (my doctor wants me to go to a neurologist because she has run out of ideas) so I don’t expect this to be a stand-alone treatment for me, but combined with my M-grain oil blend and a cup of ginger/peppermint tea, we may have a winner. Diffusing this essential oil is also a great way to relax. My headache combo above may also be a great sleep combo (yes, I’ll be trying it tonight). Interestingly, it’s also a helpful energy booster. Because of its antibacterial and antifungal properties, this is also a natural way to kill indoor bacteria and germs during the upcoming winter months. It can help you when you have a cold or the flu (and smells better than my garlic tea) and is also a cooling herb which is great in the summer months or when you have a fever. Lemongrass is known to help diarrhea and nausea as well as menstrual cramps. You can add lemongrass oil to your teas, soups, curries or to a spoonful of honey. It’s good with fish and seafood or any other foods that would benefit from a touch of lemony flavoring. It is also great for digestive system support and has been used as a detoxifier. Keep in mind, lemongrass may cause menstrual bleeding, so you should not use it while pregnant or breastfeeding. It should also be avoided by children and those with kidney or liver disease. Spiritually, lemongrass offers balance. It is uplifting and at the same time, calming. It is thought to promote forgiveness. Magical uses include love potions, purification rituals as well as being useful in awakening psychic powers. Diffuse it to banish negative energies from your home. I really learned a lot about lemongrass essential oil from my research and now I’m glad that I ordered two bottles because it has many, many uses. Did you see a benefit that would be helpful to you? *This post is not intended as medical advice.